Every year USA Hockey has the top youth hockey prospects participate in a development camp in Upstate NY or Minnesota. These camps are called National Camps or the Player Development Camps and last one week for each age group. This is an opportunity for USA Hockey to work with the top players in the country, educate them on nutrition, skill development, game play, etc. while keeping an eye on their growth for their junior and national teams down the road. USA Hockey brings in some of the top coaches in the country from junior, college, prep school and professional ranks to coach the kids. It is a great opportunity for the players to compete against the top players in the country, learn from top coaches and USA Hockey's development program, and make some lasting friendships. It is also a great opportunity for exposure as it is a great venue for junior and college hockey teams to scout the top players in the country. USA Hockey has 12 different districts across the country for youth hockey. Here in the Carolinas we are in the Southeastern District, along with Virginia, Maryland, DC, Tennessee, Georgia, Alabama and Florida. Each district has a tryout in the spring and selects a group of players to represent their district at the National Camp. The boys have Select 15's, Select 16's and Select 17's, while the girls start with the U14's. Halladay has been to the camp before, joining former Jr Hurricane goaltender Sean Romeo as a multiple year participant. Romeo is now playing Tier 1 junior hockey in the USHL and has committed to play at the University of Maine following his junior career. Kyle Hartman attends the camp from last season's Jr Hurricanes U16 AAA, and Lewis Evans will be attending from last season's Jr Hurricanes Bantam AAA team. Nick last played for the Cleveland Barons, and Laythe for the USHL Indiana Ice. It takes a lot of hard work over several years to develop into a top player. Congratulations to all these players and everyone here would like to wish them luck at their respective development camp this summer. We congratulate the above 3 teams for a great Canes Cup weekend, and we thank all of our spring teams for a fine spring season! The Girls U16 Jr Hurricanes won 3 straight games to go to the U19B Division Championship vs. Mt Lebanon Hornets at the Annual Ponytail Tournament in Laurel, Maryland this past weekend. In a real nail biter, the championship game ended in a 1-1 tie after regulation and an overtime leading to a shootout. After 4 rounds the Canes girls won 2-1 in the shootout, winning a well deserved championship. They played with great poise, control, sportsmanship, and very hard work. The U16 Girls now move on to Nationals in San Jose, California April 3-7. RYHA and the Jr Hurricanes would like to thank all of the coaches, players, and parents for a great 2012-13 season. This weekend produced an abundance of great hockey, with many close games, and excellent Championship games. We would like to recognize and thank our House league membership for their support over the past 25 years. Special congratulations to our winners, and we hope to see many of you in spring! PW A Black finished off a tremendous season by going 4-0 this past weekend and taking the CHL tournament championship at the Garner Polar Ice House. The team coached by David Wright III took down Hillsborough, Charlotte and Charleston in the opening round robin. The Jr Hurricanes then faced the Charlotte Checkers in the final and in a thrilling game trailed 1-0 late into the third period. The Jr Hurricanes scored the equalizer with 2 ½ minutes left and in stunning fashion scored the game winner 60 seconds later. With 90 seconds remaining the Checkers pulled their goalie and Black fended off a furious last push by the Checkers to take home the championship banner. The team was led by a superb defense that allowed only 3 goals in the four games and was backed by the goaltending duo of Varun Atree and Will Hopkins. The offense was led by a total team effort as seven different players scored in the tournament. The tournament championship capped a great run for the team as they went 34-9 on the season including an undefeated first place regular season CHL finish and first place finish in the Crabtown tournament. Former Jr Hurricanes Laythe Jadalla played his first USHL game for the Indiana Ice on January 5, 2013. Laythe finished the game with a plus one rating and registered one shot on goal as the team won their game over the Des Moines Buccaneers 4-2. Congrats to Laythe on this terrific accomplishment and for adding another former Jr Hurricane to the list players to compete in the USHL. We at the RYHA wish you continued success. The Junior Hurricanes Bantam A team wins the Crabtown Showdown! After dropping Game One to the Hagerstown Bulldogs 2-5, the Hurricanes earned a spot in the championship game by defeating the NoVa Ice Dogs 2-0 and the Piedmont Predators 3-1. The grit, skill, sacrifice, and determination that the team increasingly showed throughout the tournament shined in the championship game. The Hurricanes prevailed 5-4 in double overtime over the fiercely competitive Hagerstown Bulldogs. 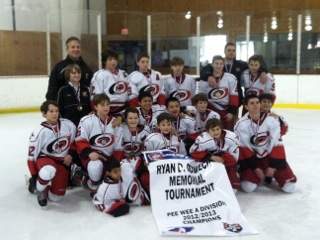 Independent of the outcome of that final game, the weekend was a tremendous success for the Jr. Hurricanes team. The players learned how well they can play when they "play together" and "play for each other". The Junior Hurricanes dropped a tough game in the Mac's Championship game on January 1st. The Jr Canes led the game until the final seconds of the 3rd period, giving up the tying goal with just 12 seconds to go. The Jr Canes battled the Vancouver NW Giants into the second overtime period before giving up the game winning goal. Congratulations to the Junior Hurricanes U18 AAA team and Coach Cotie for a great showing at the tournament. It was a quiet night at Max Bell 1 as the Saskatoon Contacts and Carolina Jr. Hurricanes faced off in semi-final action. At stake - a berth in the finals against the Vancouver NW Giants in tomorrow's Mac's Championship. While the crowd was small, the game's action could not have been bigger. The Contacts came out hot and heavy in the first, getting a pair of power play goals from Jesse Shynkaruk and Jeremy Leclerc on just six shots, giving them a 2-0 lead heading to the second. In the middle frame the Hurricanes looked like a different team, putting up 13 shots and holding the Contacts to just three shots on goal for the whole period. The barrage of Hurricane shots resulted in several spectacular chances, and while Contacts Netminder Brock Hamm made some great saves, he couldn't stop them all. Devin Warfield put in a slap shot from the point early, and then Van Sullivan capitalized on a giveaway in the slot, wristing the puck into the top corner. Jesse Schwartz then hammered one on the net and it trickled past the overworked Contacts netminder to take the lead. Kobe Kindrachuck responded shortly after with an unassisted goal for the Contacts, tying it up at 3 on just their first SOG in the second frame. In the third, Carolina's Hunter Wilhoite got the winner and Todd Jackson the insurance marker as they took the win 5-4. Gamestars were Jesse Shynkurk for the Contacts and Kyle Wemhoff for the Jr. Hurricanes. On Saturday December 8th the Junior Hurricanes Pee Wee A Black and Junior Checkers Pee Wee A teams were in Raleigh for yet another match up between these two CHL rivals. But this would prove to be no ordinary weekend game. Players and parents alike were unaware that the Carolina Hurricanes staff and a group of Hurricanes season ticket holders had something special planned for these two teams as they took the ice at Raleigh Center Ice. The game was filled with surprises from Kirk Muller and Glen Wesley on the benches to Stormy and the Storm Squad leading the fans in cheers to intermission interviews with the players. All the while John Forslund doing the play by play. The game itself proved to be as exciting as the festivities surrounding the game. After being down 2:0, the Junior Hurricanes fought their way back and tied the game with just 1:06 left on the clock. The Junior Hurricanes held off a last minute surge by the Junior Checkers to take the game into a shoot out where the Canes won the game on the last shooter. Thanks to the Hurricanes staff and fans for making this game one the kids will never forget! The 12th Annual Crabtown Showdown in Laurel, Maryland, December 28-30, 2012, provided a spectacular backdrop to showcase the skill and teamwork within North Carolina’s largest youth hockey organization, RYHA (Raleigh Youth Hockey Association), as all of its 9 travel and select teams competing in the tournament made it to their divisional championship games and 7 of 9 winning their respective championships. The Showdown attracted teams from all over the Mid-Atlantic, including Virginia, Pennsylvania, Maryland and North Carolina. 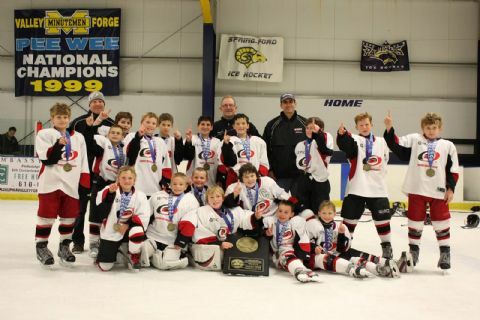 Winning Carolina Junior Hurricanes Teams included Squirt A & B (U10), Pee Wee A, B1 & B2 (U12), Bantam A (U14) and Midget Minor AA (U16). We are incredibly proud of all our players, coaches and parents for the way they represented RYHA and the Junior Hurricanes in Maryland. What a way to bring in the new year. Congratulations to all who participated. A talented team of players and their families enjoyed more than just turkey over Thanksgiving weekend; they also celebrated a hard-earned tournament victory! The Philadelphia Thanksgiving tournament began with three preliminary round games. The Jr. Canes faced off against New Jersey Team Comcast in a relentless battle with Kyler Kurtz, Zachary Auble and Ryan DiRocco each scoring a goal in the first two periods before Team Comcast stormed back scoring 3 goals in the 3rd. Clutch defensive plays from Liam Witchey and Nick D’Erasmo held the Canes on their feet as Zachary Auble buried the final unassisted goal in the 3rd period for a 4-3 win! Day two against the Pennsylvania Berks Battalion proved to be a strong team performance from nine different goal scorers! Ryan Dirocco had a three point effort with a goal and 2 assists while crisp passing plays from Cayden Kurtz ensured two more goals from Brett Repage and Corey Mulcahy in a final 9-0 sweep and shutout for goalie, Ben Calhoun, who held off all shots the Battalion could muster. Intense pressure mounted in Game 3 from the high flying team Montclair Blues who racked up 8 minutes of penalty time. The Jr. Canes scored early in the 1st with a nifty goal from forward Ethan Chipping assisted by Dillon Phillips. The rest of the game was a battle of skill and determination from both teams. Despite a power play and pulling their goalie, the Blues could not solve the clever stick of defenseman Zachary Raimundo nor put any pucks past, Jr. Canes goalie, Tade Carman, who closed the door in net all 3 periods for a victorious shutout and spectacular 1-0 triumph! The Jr. Canes remained undefeated in the preliminary rounds! The Semi-Finals started out fast against the Prince William Panthers with three unanswered goals by the Jr. Canes in the first eight minutes. Kyler Kurtz started the 2nd with a quick goal 15 seconds in assisted by Ryan DiRocco. The Panthers seemed to fade away under the relentless offensive pressure and Jr. Canes goalie Ben Calhoun in net just saying “no”. 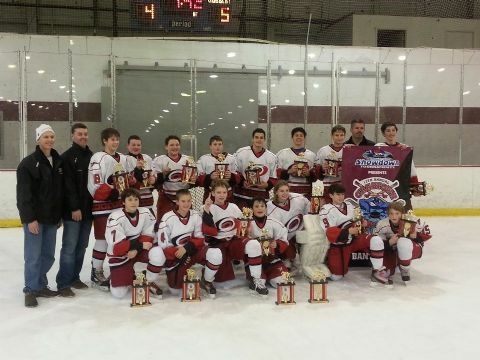 The Jr. Hurricanes cruised to an 8-1 victory and first place Championship slot! Nerves rattled as the Jr. Canes skated onto the ice, sticks in hand, at 3:00pm for the Championship game. New Jersey Team Comcast returned for a 2nd skirmish. Team Comcast struck first midway through the 1st period with a quick wrister through traffic. The Jr. Canes struck back in the second with a hard shot from Jackson Collins, assisted by Zachary Raimundo tying the game to one all! The end to end action was furious as both goalies fought off numerous chances between the pipes. With Team Comcast pressuring, the Jr. Canes went down a man at 2:48 seconds in the 3rd period – it seemed the gold might just slip away - but the defensive composure by Jackson Cowen and Brandon Horne held steady on successive 3 on 1 plays. Excitement built with inconclusive 5 minute overtime results -the game remained tied at 1-1. Pressure mounted as the two teams moved to a shootout for the gold. With nerves as cool as ice, #15 Ethan Chipping, #70 Jack Gleason & #88 Kyler Kurtz systematically cracked the combination to Team Comcast’s safe 15-70-88; as Jr. Canes goalie, Tade Carman, stood tall - stopping all shooters and sealing the deal to find 17 shiny gold medals and the Philadelphia Liberty Cup inside! A 1st place Championship plaque was carried home by Coach Colin Kurtz and Assistant Coaches Matthew DiRocco and Dominick D’Erasmo. Victory tasted better than turkey on Thanksgiving weekend! Billy Christopoulos was named Goalie of the Week in the USHL in Week 10. This is the second time Christopoulos has won the award in the USHL this season. The 18 year old from Raleigh, North Carolina is a rookie in the USHL this season playing for the Des Moines Buccaneers. On Friday, Christopoulos stopped 37 of 38 shots against Sioux Falls. Trailing 0-1 after the first period, the Buccaneers came out with 2 quick goals to start the second period. Only 5 seconds after the Bucs took a 2-1 lead, Sioux Falls has an odd man rush and made a beautiful pass for a back door tap-in, only to have Christopoulos sprawl to do the splits and make a pad save to preserve the lead. Holding the pressure off during the next 10 minutes, Des Moines then caught a break as the Sioux Falls goalie was caught behind the net trying to play the puck when it caromed in front for an easy empty net goal and a 3-1 lead heading into the 3rd period. Sioux Falls came out trying to get back in the game, but Christopoulos was determined to keep them off the board, stopping 3 breakaways and 3 two-on-one breaks. The leading scorer for the Sioux Falls Stampede had a glorious chance mid-way through the 3rd period when he found himself all alone in front for a one-timer; all 5 Stampede players raised their hands and the crowd began celebrating, only to find out Christopoulos had it in his glove. The Bucs responded with a fourth goal to ice the game and added a fifth for insurance. Christopoulos earned 1st Star of the Game for his performance. Former Jr. Hurricane Sean Murphy played for the Stampede but was held off the scoresheet, something I am sure the boys will talk about back home in Raleigh in the summer. The coach came back with the hot hand on Saturday as Christopoulos was in net again against Sioux City. Sioux City came out with a game plan to slow the game down and play it tight, and it was a tight-checking affair. The shots were 7-6 for the Bucs after the 1st period and they had a 1-0 lead. It was 2-1 after two periods. In the third the teams again traded goals before Sioux City pulled their goalie for an extra attacker and were scored on twice to lose 5-2. Christopoulos went 25-27 on the day but it was the timing of the saves and steady presence that spurred his team on for the victory. Christopoulos now has 5 wins in his last 7 starts and he is now ranked 6th overall among goalies with a .919% save percentage. More importantly, the team currently sits in 4th place (top 4 teams make the playoffs), tied with the Fargo Force (former Jr. Hurricane Charlie Pelnik plays for Fargo) for the 4th playoff spot, 2 points out of 2nd place. The team is a very young team that was supposed to struggle this year but they have come together quickly to battle their way up the standings. This is the second time Christopoulos has won the award this year. 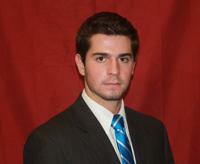 His former teammate, goalie Sean Romeo from Cary, NC, won the award as Goalie of the Week last week. Romeo plays for Youngstown in the USHL. The two were goalie partners for several years with the Junior Hurricanes before moving on to the junior ranks. Which one is going to win the award next? We would like to congratulate Christopoulos on winning the award this week and wish him good luck for the rest of the season!